It’s hot and sweaty in Los Angeles but we are on a mission. On this day we needed some international food which we were unsatisfied with in San Diego. Well this lovely City of Angels had just the solution for satisfying our international hunger so we made the 2 hour trip in search to fill our bellies, where we found El Pollo Inka. With so much traffic in the L.B.C. (“it’s kinda hard bein’ Snoop D-O double G”) we slowly made our way up to Manhattan Beach to El Pollo Inka. Run by a Peruvian, this chain of restaurants is scattered throughout L.A. Typical Peruvian restaurants contain either traditional Peruvian dishes or pollo a la brasa aka “rotisserie chicken”. This particular restaurant combined the two in order to satisfy all walks of Peruvians so that no one has to choose between the two. It’s rare, and it’s genius. As you walk through the door, the large rotisserie is obvious and you can see the chicken slowly turning as the flames jump up and bite at the skin. Because our stomachs ached for the traditional dishes of the Incas we immediately ordered papa relleno as an appetizer (above): a beef-stuffed potato with half a hard boiled egg and some olives inside. After having drooled over the menu and gazing at the decor (being annoying tourists) we finally made our decision and ordered two different plates: Arroz con Pollo, and Lomo Combinado. 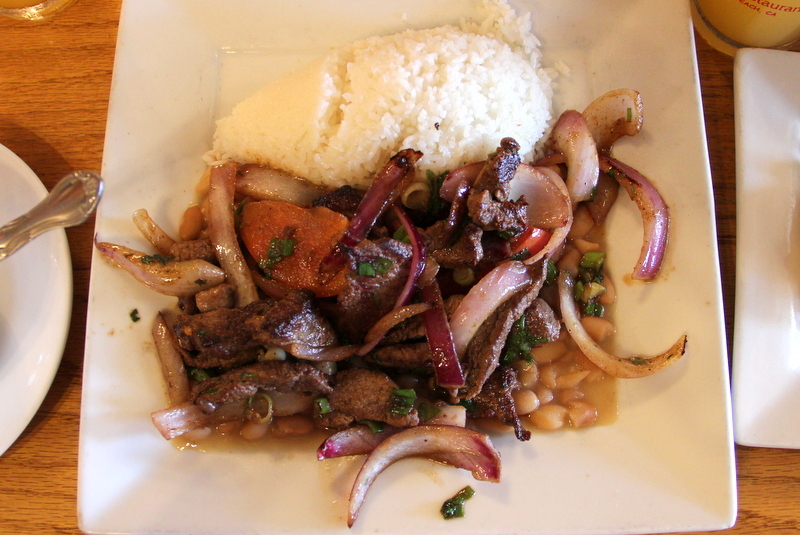 The lomo combinado (below) is similar to the traditional lomo saltado but instead of steak sauteed with onions and mixed with fries, it was mixed with peruvian beans. The arroz con pollo (below) was made different today because they normally chop the chicken up and mix it in with the cilantro based rice. They gave my friend, however a healthy serving of a chicken breast so it was as if he had ordered 1/4 of a plate of pollo a la brasa. I think they took a liking to him. They also topped it off with salsa criolla which isn’t like your typical Mexican salsa that Americans are so accustomed to. No, Peruvians have their own flavors. It’s simple: sliced onions and tomatoes marinated in salt, pepper, and lime. No heat, just flavor. We also ordered a traditional Peruvian drink called maracuya, or passion fruit juice, to add to our dining experience. They brought out a complimentary side of bread with butter first and then a delectable soup called aguadito: a chicken and rice soup with a cilantro base. Lord, Hallelujah. Suffice it to say, we were stuffed. Our cravings were kicked and we needed to walk our fat, happy selves around before taking another 2 hour drive back home. But who walks in this city of disastrous traffic? Luckily, Venice Beach is just north of El Pollo Inka and we had plenty of time to chillax.